Can you spot the catalytic converter? It is integrated now into the engine block. Photo courtesy of Truck Trend. The secret to stopping theft? Re-engineering the exhaust manifold to integrate into the block which allowed them to bring the catalytic converter from underneath the truck into the engine bay. Then, the catalytic converter was wrapped with heat shield, to keep it from melting next to the engine block, and squeezed in behind the engine. It is so tightly integrated into the engine bay that even taking a photo of it is quite difficult. What does this all mean for thieves? Good luck! In order to steal the converter now, thieves have to first figure out how to pop the hood. Then, they have to figure out how to get a cutting tool down behind the engine and around a variety of engine parts and hoses. Finally, IF they are able to cut it free, they have to maneuver it up and around to pull it free. In short, thieves looking for an easy buck, will not be stealing these catalytic converters. 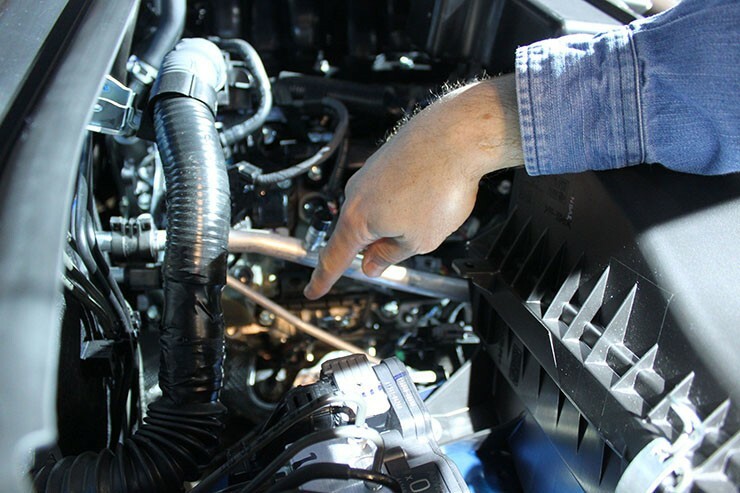 Why Is Catalytic Converter Prevention A Big Deal? An integrated catalytic converter may not seem like that big of a deal, but the ongoing thefts of them is a real pain for owners and car dealers. In most truck setups, the catalytic converter hangs below the truck and is part of the exhaust pipe. All thieves need to do is take a Sawzall or RotoZip and cut them free. Then, they sell them for the platinum metal contained in them. Over the years, we have detailed many thefts of these converters as well as different prevention devices like a CatClamp. Engineering it into the block looks to be the ultimate solution to this problem. My story on Truck Trend details how Toyota engineers were able to redesign the exhaust manifold to fit into the block engine as well as concerns over quality, durability and reliability.